Liverpool were beaten 4-3 by Manchester United U16s on Saturday with prolific Nigerian starlet Mipo Odubeko having a hand in three goals. The Irish-born striker continues to enhance his reputation with several goals for Manchester United U16 and U17 teams this season. Odubeko bagged a brace and provided one assist as the Red Devils came out on top in a thrilling contest against Liverpool. 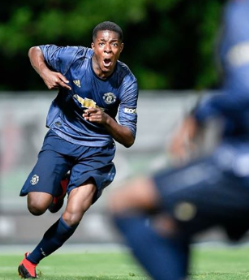 With Odubeko's red-hot form for Manchester United, it is a foregone conclusion that the Old Trafford outfit will tie him down to a new deal in the summer when they announce their new intake of academy scholars. He has been remarkably good at U16 level and would be hoping to make his debut in the UEFA Youth League in the next round of the competition. Odubeko's U16 teammates, Deji Sotona and Shola Shoretire have also caught the eye this season, with the latter becoming the youngest player in history to feature in the UEFA Youth League.